Volvo Construction Equipment has revealed the EX2, a fully electric compact excavator prototype that it says delivers zero emissions and 10 times the efficiency of traditional combustion models. The futuristic prototype was unveiled in front of an audience of industry specialists, policy makers, academics and the media at the Volvo group Innovation Summit held recently in London. Volvo says the EX2 came out of the company’s ELEXC sustainability research project, which was partially financed by the French government. The company says sustainability is key to future success. “In line with the Volvo Group’s vision to be the most desired and successful transport solution provider in the world, Volvo CE is committed to contributing to sustainable development,” Volvo senior president of marketing Thomas Bitter says. “At Volvo CE we are developing technologies connected to electromobility, intelligent machines and total site solutions that will benefit our customers and the environment by contributing to increased machine performance, productivity, efficiency, safety and sustainability. “Our future products and services will play an important part in building a sustainable society,” Bitter adds. 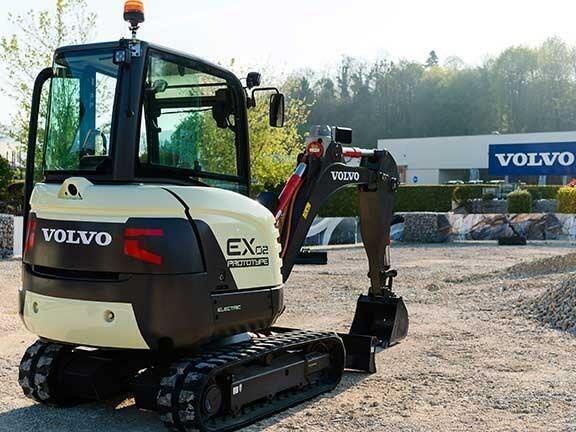 In order to make the EX2 fully electric, the traditional combustion engine has been replaced with two lithium-ion batteries producing 38KWh – enough power to keep the machine operating for eight hours in an intense application such as digging hard ground. The hydraulic system has been replaced by an electric system that uses electromechanical linear actuators that optimise the transmission chain. By removing the hydraulics and combustion engine, Volvo has reduced noise levels and the need for engine cooling. “The electrification of construction equipment will produce cleaner, quieter and more efficient machines – this represents the future of our industry,” EX2 project lead engineer Ahcene Nedjimi says. “Ten times higher machine efficiency and maintenance-free systems mean that operating costs and total cost of ownership would be significantly reduced. The prototype machine delivers the same power and force as its conventional counterpart, as well as faster speeds in combined movements,” Nedjimi adds. At this stage, the EX2 is purely a research project and there are currently no plans for commercial production.